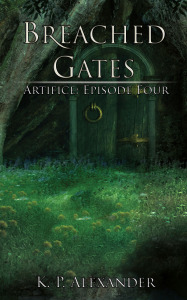 I just hit the Publish button for Artifice: Episode Three! It’s the moment you’ve all been waiting for. Amazon: Submitted and waiting for their automated vetting process to finish. I’m hoping that this happens before I wake up tomorrow. But, it could possibly take until Thursday. Edit: Now available! Kobo: Submitted. This is the first time I’ve published straight to Kobo, so I’m not sure what to expect. Hopefully before Thursday. Now available as well! Barnes & Noble: This is being distributed to them via a third-party aggregator, and has to go through a vetting process. Unfortunately, that could mean a wait of up to two weeks… Edit: Surprise! Looks like B&N beat Amazon to the punch. Now available. Once the majority of the major retailers have it in stock, I’ll be sending out an email to all of you on the New Release Mailing List. I just realized that this site looked horrible in Internet Explorer due to some wackiness with the WordPress theme – it should now be fixed. Episode Two is now available for free on Amazon.co.uk… still waiting for the Amazon.com link to go free. Am still looking into implementing some sort of mailing list to keep you guys updated on new releases and such. More on that soon.